Install new decorative baseboard diffusers and update the look of your home or office. These air vent covers have a wicker pattern design and are perfect for both residential and commercial locations. Decorative baseboard diffusers are as functional as they are beautiful due to the adjustable damper. 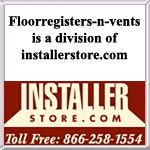 Air vent covers with an adjustable damper will allow you control over the amount of air flow. Another great feature of the decorative baseboard diffusers is the removable faceplate. 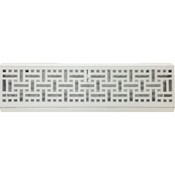 This removable faceplate on the air vent covers makes decorative baseboard diffuser installation and maintenance a breeze. Our air vent covers are made of stamped steel for ultimate durability. The decorative baseboard diffusers are then finished with a white powder coat finish to prevent rusting. Check out all of the standard or decorative baseboard diffuser options we have to offer. Replace old rusted and dented air vent covers and have new ones shipped straight to your door. Order today!